Safety first! 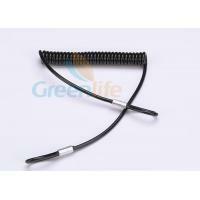 Greenlife offer a variety of coil tool lanyards here, select your preferred product. 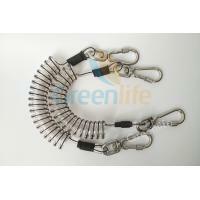 Popular style coiled tool lanyard provides extra security to your hand tools. 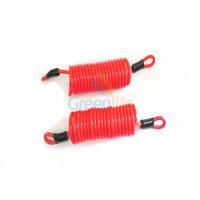 Coiled rubber covered exterior will not rattle and provides years of hassle free use in all weather conditions. Custom hardwares on both ends are available. 1. Eco-friendly strong PU material,light-weight polyurethane tubing. 2. Prevents valuable items from being lost, broken or becoming a falling hazard. 3. Fantastic and best leash / tether for securing any tools, rods, scuba diving and all other you don't want to drop. 4. 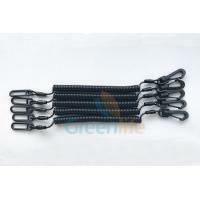 Ends are plastic / metal clips / hooks that can be clipped onto tools, rods, reels, cameras, pistols, etc. 5. Coil has an excellent memory and returns back to a small tight coil after use. 6. Popular two styles with or without a stainless steel cable core. 7. Coil is thicker, stronger, durable, long-standing, no fade, long life time, kink and abrasion resistant. 8. Fashion design, beautiful look, comfortable feel. 9. Various of styles, sizes, colors are available. 10. Any high-standard coil lanyard is welcome here, top quality with reasonable factory price. Size: cord dia/stretched length can be customized. Color: standard solid black and clear, any Pantone color. Accessory: Metal/plastic hook, snap hook/swivel hook, key ring/split ring, clip, ring, pin, quick release buckle, buckle with string loop, others holders/connectors, webbing straps, customized. Mini order quantity: 500pcs per standard colour. Free of stock sample, 1-2days, freight on you. Charge of fresh sample, 5-7days, sample cost and freight on You. Multi-usage, as per your need! GREENLIFE INDUSTRIAL LIMITED is a professional manufacturer and exporter of high quality safety coil lanyards, with our sincerity, to offer full range and professional services only the best to all clients from all over the world. GREENLIFE started to provide safety solutions since 2008, after more than 10years of development, became a leading supplier in safety coil lanyard industry with own facility nearly 3000sqm in China. We focus on customized plastic coil lanyards, retractable lanyard holder, related hardware accessories, plastic accessories in security system. With high quality standard, excellent manual skills, advanced teconology, strict quality control and professional sales service, Greenlife aims to provide our customers, distributors and suppliers with win-win cooperation in long time. 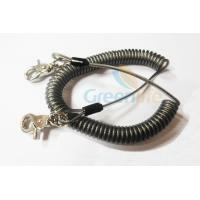 Greenlife manufacture all system of plastic coated coil lanyards / leashes. 1. Plastic coil lanyard; 2. Plastic tool lanyard; 3. Wire coiled lanyard; 4. Coiled key lanyard; 5. Jet ski safety lanyard; 6. Quick release coil lanyard; 7. 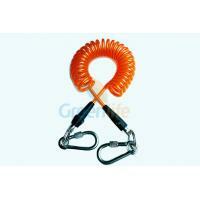 Surf coiled leash; 8. 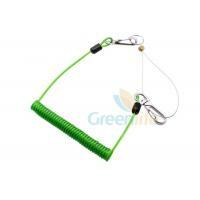 Children safety strap; 9.Coil fishing lanyard; 10. Pistol coil lanyard; 11. 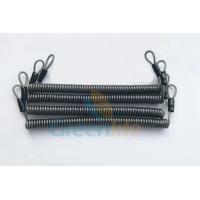 Stylus tether cord; 12. Retractable tool lanyard; 13. Custom coiled cable; 14. 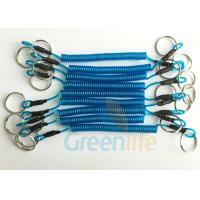 Snap hook carabiner; 15. all lanyard accessories. outstanding OEM and ODM capability, customized special drawings or ideas all will be able to become true. Different plastic material are all environmentally friendly and approved by ROHS, SGS, etc. 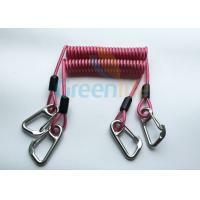 Various of high quality safe coil lanyards had been exported to America, Europe, Japan and Korea. Fully received high reputation from clients. We are the shareholder of Chinese four spring coil lanyard factories till now, and established good and long-term partnership with other plastic/metal hook & buckle & other accessories largest and professional manufacturing companies. The good partnership provides us the professional production conditions, advanced technologies, prompt technical supports and rich experiences. Gradually build into a center for the production of Guangdong province, and the marketing network and exporting door of Shenzhen, establish the complete and comprehensive product supply system in fully foreign markets. "Customer is God", attitude is everything. We represent the interests of customers, has pledged to provide all-round high-quality and unique services, do best services to cusotmers, meet cusotmers, to create maximum customer value. Quality is the fundamental operation, Greenlife high-end positioning is to create a strong Greenlife brand by top products quality. Mentioned Greenlife, the products from Greenlife certainly will be trustworthy, this conclusion has been proved by groups of foreign customers for a long time. No quality of product, equal to no capital to a corporation. Heart-to-heart services, honesty-to-honesty operation, your satisfaction be we pursue! Quality First, Service First, Credit First.